The Potomac Riverboat Company's water taxi fleet services National Harbor in Maryland, Alexandria in Virginia, and Georgetown and The Wharf in D.C. See video. 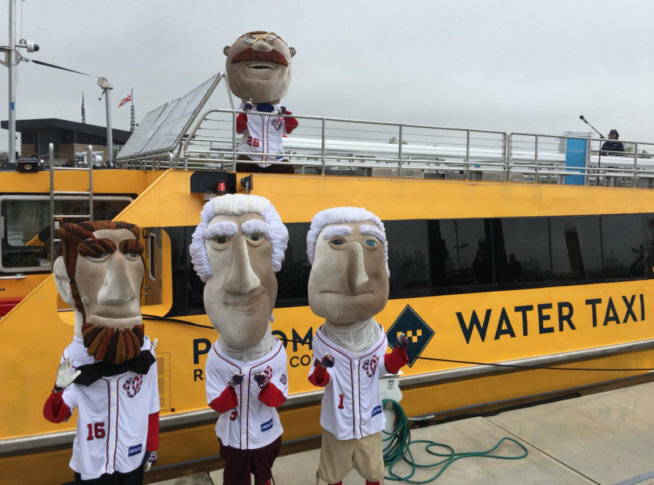 WASHINGTON — The new water taxis christened with the smashing of champagne bottles represent the future of water transportation in the D.C. area, officials said Wednesday. The four high-speed, low-wake, environmentally friendly water taxis welcomed with the nautical tradition join the Potomac Riverboat Company’s existing fleet, servicing National Harbor in Maryland, Alexandria in Virginia, and Georgetown and The Wharf Transit Pier in the District. Two of the boats have been in service since last October; two are new arrivals. “I see today, at least for our city, as the beginning of a new era of transportation in the region,” D.C. congressional Del. Eleanor Holmes Norton said at the event. “I believe that this entire region should be connected through water taxis,” she added. Norton is a member of the House Transportation and Infrastructure Committee. Alexandria Mayor Allison Silberberg noted that the water taxis can be used by commuters for work or by people seeking to explore entertainment options in the D.C. region. “The Potomac River really is the original highway of our region,” Silberberg said.